Part 1 Materials: Phenolic resins as a matrix material in advanced fibre-reinforced polymer (FRP) composites; Polyester resins as a matrix material in advanced FRP composites; Vinylester resins as a matrix material in advanced FRP composites; Epoxy resins as a matrix material in advanced FRP composites. Part 2 Processing and fabrication: Prepreg processing of advanced FRP composites; Resin infusion/liquid composite moulding (LCM) of advanced FRP; Filament winding processes in the manufacture of advanced FRP composites; Pultrusion of advanced FRP composites. Part 3 Properties, performance and testing: Understanding and predicting interfacial stress in advanced FRP composites for structural applications; Understanding and predicting stiffness in advanced FRP composites for structural applications; Understanding the durability of advanced FRP composites for structural applications; Testing of pultruded glass fibre-reinforced polymer (GFRP) composite materials and structures. Part 4 Applications: Advanced fiber-reinforced polymer (FRP) composites to strengthen structures vulnerable to seismic damage; High performance fibre-reinforced concrete (FRC) for civil engineering applications; Advanced FRP composite materials in bridge engineering: Materials, properties and applications in bridge enclosures, reinforced and prestressed concrete beams and columns; Applications of advanced FRP composites in bridge engineering: Rehabilitation of metallic bridge structures, all FRP composite bridges and bridges built with hybrid systems; Advanced FRP composites for the manufacture and rehabilitation of pipes and tanks in the oil and gas industry; Sustainable energy production: Key material requirements; Advanced FRP composite materials for sustainable energy technologies; Improving the durability of advanced FRP composites using nanoclay; Advanced FRP composites for the rehabilitation of timber and concrete structures: Assessing strength and durability. Advanced fibre-reinforced polymer (FRP) composites have become essential materials for the building of new structures and for the repair of existing infrastructure. 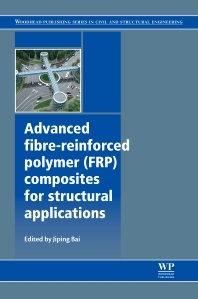 Advanced fibre-reinforced polymer (FRP) composites for structural applications provides an overview of different advanced FRP composites and the use of these materials in a variety of application areas. Dr Jiping Bai is a Reader at the Faculty of Computing, Engineering and Science, University of South Wales, UK.